I'm linking up with Elizabeth Esther today for Saturday Evening Blog Post. It happens once a month. Check it out for some great posts! So glad I saw this come through my reader. I've been voting for you on the Circle of Moms Top 25 Faith blog contest when I've gone over to vote for all the other great blogs I love. I'm had a few new visitors by being part of it, but will admit the popularity contest format is not a favorite of mine. Thanks Laura, I'll check it out. Love that Friday Five list, too! No schedule, yay! 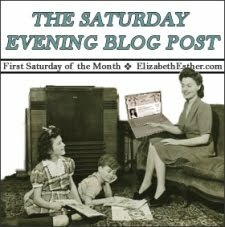 I'm visiting from the Saturday Evening Blog Post and just wanted to say hi. I enjoyed looking around your site, and even though I have only girls! I will be back to visit again! : ) I hope you enjoy the rest of your weekend.